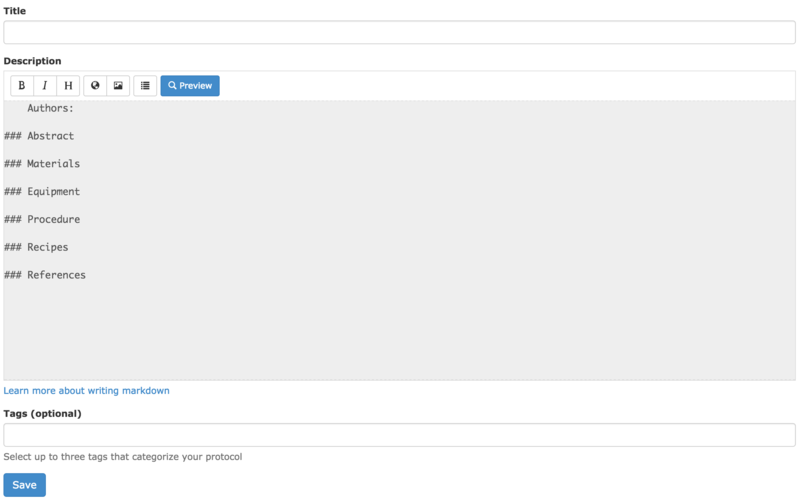 Click the new protocol button to create a protocol. If you have not yet signed in you will be prompted to sign in. Fill out the title and description of the protocol. The description field should contain the main body of the protocol. It is pre-populated with recommended sections to complete. These sections are only a guide. Feel free to structure your protocol in a way that works for you. You can preview your progress by clicking the preview button. This will show you your protocol as it will appear when published. Click the preview button again to return to the protocol editing mode. The description field should be written in markdown. The purpose of markdown is to allow you to write using an easy-to-read, easy-to-write plain text format that converts to structurally valid HTML. Learn more about markdown. You can add an image to your protocol by linking to it. You can link to any image publicly available on the internet. If your image is stored locally on your computer we recommend Imgur. Imgur is free to use. Simply create an account, upload your image and then copy the direct link to that image. Once you have copied the direct link to the image click the image button on the protocol form and paste the copied link into the text box that pops up. You may select up to three tags that categorize your protocol. Search for an existing tag by typing some or all of the letters that make up the tag. If your tag doesn't exist yet you can create it by typing the full tag name and pressing tab. You can save the progress of your protocol by clicking the save button. The first time you save a protocol it will be saved in a draft state. This allows you to save the progress of your protocol as you go. When you are satisfied that your protocol is complete you can publish it. This will make the protocol publicly available. See the protocol publishing section for more details of the publishing process. To save you having to reenter a protocol you already have stored in a Word document you can upload it. Click the Choose File button and select the Word document you have stored locally. The file must have a .doc or .docx extension. When you have selected the file click the Upload button. This will upload the Word file, convert that file to Markdown and replace the contents of the protocol description field with that Markdown. Starting from a Word document is optional but you might find it a more convenient starting point for your protocol. Editing a protocol is much the same as creating one. You can only edit protocols that you are the author of. If you would like to use a protocol that another researcher has authored as the template for your protocol you can fork the protocol. See the forking page for more information on protocol forking. To edit a protocol simply view the protocol and click the edit button. When a protocol is first created it is in a draft state. When you're satisfied the protocol is ready to be publicly visible you can publish it. If for any reason you wish to take the protocol down temporarily you can also unpublish the protocol. The publish/unpublish button is found in the right column of options when viewing the protocol. Only the protocol author will see these buttons. If you wish to delete a protocol you can do so by clicking the delete button found in the right column of options when viewing the protocol. Only the author of a protocol can delete it. Once you have deleted a protocol it cannot be recovered.